This debut release from the Tony Wilson 6Tet is the first documentation of the ongoing musical investigations this group started four years ago. Each composition explores various styles and sonic possibilities. Melancholy melodies, collective noise improvisations, metre shifts and African rhythms stand side by side and combine to give this ensemble a very different and original sound. References might be to artists such as Albert Ayler, Sonny Sharrock or Bill Frisell, but because of the individual approaches of each player, this band will remind you of no one else. 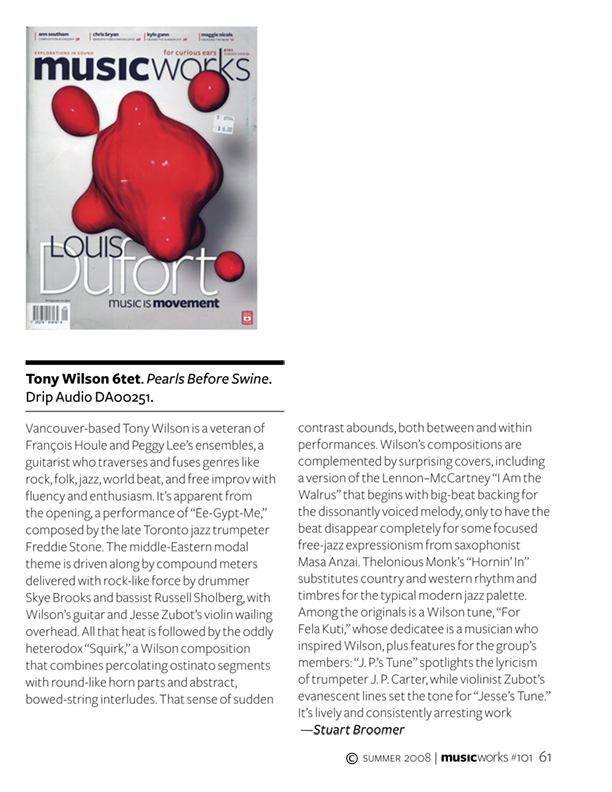 The four cover tunes are Tony's homages to the artists who have influenced him over the years. The original compositions range from intimate ballads to ostinato driven collective improvisations and include a guest vocal performance by folkster Kevin House. Vancouver's Coastal Jazz and Blues hails him as "unquestionably one of the most original guitar stylists on the Canadian scene. Down Beat Magazine entitles him as "...a talismanic West Coast figure." Tony Wilson has studied with many acclaimed jazz musicians including Dave Holland, John Abercrombie, Kevin Eubanks and Steve Coleman and has shared the stage with well know international artists such as William Parker, Gerry Hemingway, Han Bennink, Toby Delius, Benoit Delbecq & Eric Boeren. The personnel behind the 6tet is Tony Wilson (guitar, kalimba, and loops), J.P. Carter (trumpet, cornet and electronics), Masa Anzai (alto sax and electronics), Russell Sholberg (double bass), Jesse Zubot (violin) and Skye Brooks (drums and percussion). The members of the Tony Wilson 6tet are a part of Vancouvers prolific creative music scene and also perform with Fond of Tigers, the Veda Hille Band, Bison, Great Aunt Ida, Dark Blue World, Kevin House, Zubot & Dawson, Inhabitants and many others. "Pearls Before Swine rewards repeated listening." - Exclaim!